One of our favorite memories of our recent trip to the Smoky Mountains was the evening we were resting on a bench in downtown Gatlinburg when a group of teenagers walked up and started setting up to perform a free bluegrass concert. The five band members were all between the ages of 15 and 17. But their musical ability was incredible. As I watched the 15-year-old red-headed Abby play the fiddle, I wondered what it would be like to be so talented at such a young age. Was she born into the world a musical prodigy or was it just the outpouring of 10 years of practice and hard work? I started daydreaming again about my secret desire to be a rock star (or at least a bluegrass singer) when my eyes started focusing on the girls’ footwear. I think my chances of becoming a famous banjo player are a little limited at this point in life, but hey, I could at least think about buying some cowboy boots. A few hours later, we were walking down the strip when we spied the huge cowboy boot store across the street. “Let’s go look around, just for fun,” my husband and I both agreed. As soon as I saw the pricetags I was determined that we were only window-shopping. This was not my typical $29.99 shoe binge at Kohl’s. Maybe we were just giddy with the joy of not having our children hanging on our hips begging for their own cowboy boots, but soon both my husband and I were searching the shelves for a size 8 for me to try. The minute I plopped down on the bench to try on a pair of cowboy boots “just for fun” I heard his voice. Right. Right. Well, I guess you have to have socks even if you are only trying on the boots for kicks. I think I mumbled something about how “I’m just looking” and attempted to give him the ol’ Midwestern cold shoulder. But soon this friendly creature with the laughing face was running around the store searching for styles and sizes that would work for me. I have enough experience in sales to know exactly what he was doing. He was treating me like someone who was going to buy a pair of cowboy boots. And if he had any doubts, he wasn’t letting them show. Despite all my efforts at staying mentally focused, his confidence was starting to wear off on me. Now, I was starting to see myself as someone who was going to buy a pair of cowboy boots. A little later, as I was checking my reflection with a light brown suede boot on the right foot and a darker boot on the left, another customer walked up to see my selection. Huh? Now I look good in cowboy boots? Maybe it was my general lack of self-esteem in my expanding prego body. Or maybe it was the fact that it was very humid and it was a horrible hair day. But I floated across the store on his words. I’m not only a person who is going to buy a pair of cowboy boots, I’m a person who looks good in a pair of cowboy boots. Finally, I was starting to accept my new identity. My smiling salesman had handed and sorted and run up and down stairs to find boots for me to try, when he offered to leave us alone to talk about it. He left me in the capable hands of his two female assistants. And they offered the one last straw that he had not given me. I was debating between two pairs. One was about a third more expensive than the other. It was also clearly more comfortable. More durable. Higher quality. She gave me just what I wanted deep inside: She told me what to do. She gave me a reason to spend more money. Now, I was not only a person who was going to buy a pair of cowboy boots and a person who looked good in cowboy boots, I was a person who deserved boots that are comfortable and won’t make me fall down on the icy sidewalk. Well, of course I’m going to get the more expensive pair. Who do I look like? Some city slicker from Chicago? My boot-buying experience reminded me of a lesson that is not only important in sales, but in life. People will act the way they are treated. In many cases, people will actually become the person they have been told they are. I can think of so many instances in which someone has treated me in a negative way and I have reacted by being a negative person. I have actually started thinking of myself as unlovable or untalented or stupid, because that is how someone had treated me. I’m sure I’ve done the same thing to someone else. On the other hand, I can think of people who gained self-confidence and ability because I treated them like the person they should be rather than the person they were at the moment. I believed in them before they believed in themselves. I’ve been having a bit of buyer’s remorse over the cowboy boots that now sit in my closet with no where to go this summer. But I’m grateful for the experience. When I look at those boots, I hope they will always remind me to treat people with love and respect and to assume the best of them. Who knows? Maybe I can encourage someone else to believe the best about herself. Next Post Next post: Does that come with a cup holder? Thanks for all the positive affirmation! =]Love the story, Kacie… that is great! I love this blog post and I really dig those swanky boots. Don't let them collect dust girl- those are a fashion statement waiting to be made!! !But I'll admit… I have two pairs of boots with just about the same story as yours. Smiles! 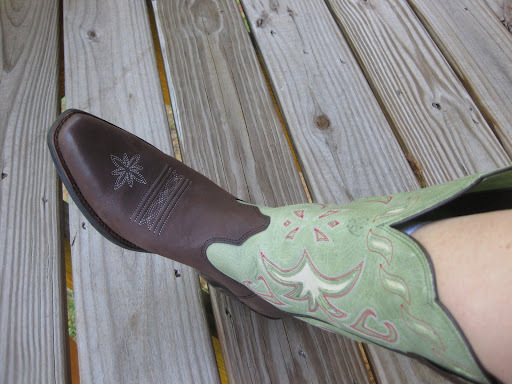 Emily, I love your boot story and growing up in Texas I have had several pairs of boots. Just remember this winter to wear your booths to a show when you have to work at 12 hour shift and you will find that boots are so very comfortable and so worth the money. Janice StokesPS . Will miss you at convention. The boot story made me smile (smile BIG because I can picture the whole thing). Your lesson was such a good reminder. I think of it 1st with my kids. Thanks for reminding me that I have a huge impact on the with just the way I treat them. It is also true with friends and strangers, too(at the grocery store and other places), I think. What a fun story with a powerful lesson for every day life!